The Villa was built on the hills of Fiesole, during the early 15th century, by the first milestone on the road from Florence to Bologna, starting from the San Gallo. 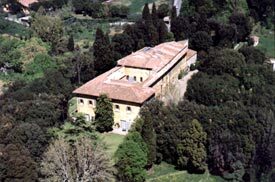 Early records date from the 15th century, when it was known as the “Villa Montughi”, part of the estate of the Riccoldi family. It was the property of successive powerful Florentine families (the Giugni, then the Della Stufa, the Lorini, the Martelli, the Nerini and the Soderin families). Each new owner built extensions and carried out improvements. In 1586, the Corsi brothers – Bardo and Jacopo di Giovanni – paid 5,500 florins for the acquisition of this superb building. This considerable sum showed the interest in this Villa during the Renaissance. The Corsini remained the owners of the property until 1816. This was the golden age of the Villa, which was visited by princes, cardinals, ambassadors, poets and musicians. It was favoured by its excellent situation on the hill to the north of Florence, on the Bologna road, an important thoroughfare for the celebrated guests of the Grand Duchy of Tuscany.